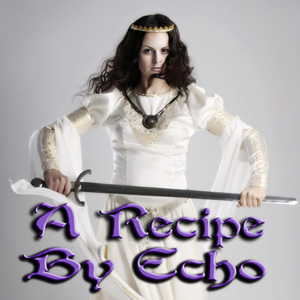 In my novel, Lady of the Mist – Book 4 of my Legacy of the Blade Series, Echo is a pirate who falls in love with her captor, Garrett who is a baron of the Cinque Ports. At the end of the story they eat crowdie, a Scottish dessert with cheese curds, oats and whisky, and Echo finds something inside the dessert that Garrett put there. 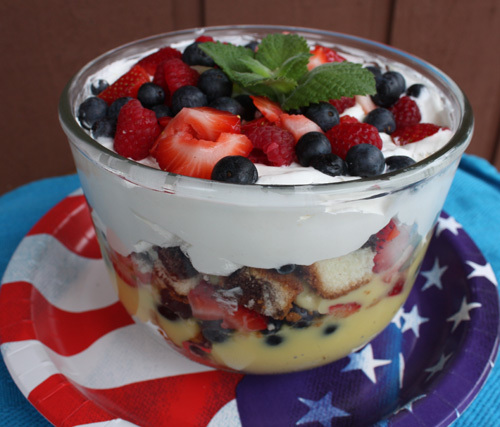 Since I’ve tried making crowdie and did not care for it, I asked Echo to tell us about a more modern dessert that I know everyone loves – a trifle. Echo? Echo: Well, back in the middle ages, crowdie was a favorite especially amongst the Scots, like Storm MacKeefe. And in the dessert would be hidden objects. According to which object you found in your dessert, it supposedly told you about your future. I don’t want to spoil the surprise, but let’s just say I loved what Garrett hid inside my crowdie dessert! Here is the recipe for a trifle which is something that is along the same lines, but more people today would enjoy. Elizabeth makes it every 4th of July, though that is a holiday I don’t celebrate. Still, it is great any time of the year. Put down a layer of the chopped pound cake in the bottom of a clear glass bowl. A clear bowl in necessary to see the beautiful layers. 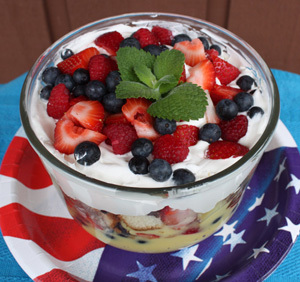 Then add a layer of pudding and some of the strawberries and blueberries and a layer of whipped topping. Repeat this for a second layer and on the top, add the raspberries as well as some of the rest of the fruit. Refrigerate for several hours at least to get the best flavor and to make sure the pudding is set. This is simple to make and very quick if you need a dessert last minute. Watch Legacy of the Blade book trailer video, or click book cover below to buy. I do believe I will be making this, this weekend. Sounds yummy! I’ll be making this for English in-laws this month! Gret recipe!